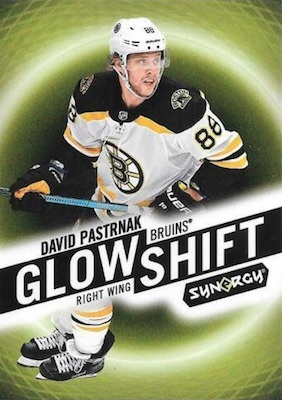 Take two for the insert/parallel-driven NHL set, 2018-19 Upper Deck Synergy offers up some rare cards, unique looks, and a whole lotta color. Although the 2017-18 product was not very well received, the '18-19 release does not appear to make any big changes. Hobby boxes again deliver a mix of parallels and inserts. However, there are several tweaks to the output. One difference is that the autographs are a bit easier this time at around 1:3 boxes. The signed cards were more like 1:5 boxes for '17-18. Collectors can also expect 6-7 of the more premium cards per box, including numbered cards, metal/tech cards, or autographs. 2017-18 only had one of these cards per box. 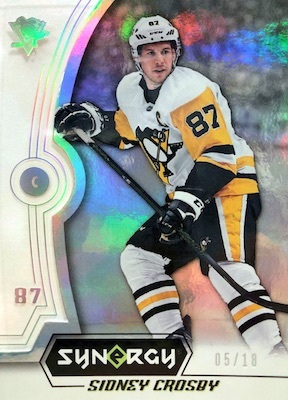 The 100-card set in 2018-19 Upper Deck Synergy Hockey can be a little tricky because the actual base set is very rare while many of the parallel sets are quite common. Base veterans have just 18 copies, legends are limited to eight copies, and rookies are numbered to either 19 or nine copies. Whereas 2017-18 reserved the last two base cards (#99 and #100) for the UD Bounty Program, no such limitation exists for 2018-19. Again broken into four different color tiers, versions include Red, Blue, Green, and Purple. Red editions average one per pack, and the other three colors combine to fall five per box. Although none of the base parallels were numbered in 2017-18, many of the rookie parallels and all of the Purple cards are numbered this time. 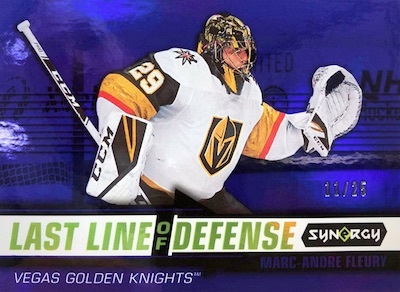 Building on that, the 2018-19 Upper Deck Synergy Hockey checklist features a new crop of inserts to chase. Combining to average six per box are the Last Line of Defense (1:5), Post Season Perfection (1:4), and Significant Selections (1:5) cards. All three sets have Green (#/149) and Purple (#/49) parallels, as well. Numbered to 999, Exceptional Talent falls two per box. These have only a Black parallel that is numbered to 35. One tougher option is Cast for Greatness (1:67 packs), which is the metal set carried over from last year. Upper Deck also teased more unannounced content that they call "easter eggs." Last year had the surprise Color Shift set that changes color in bright light. With overall odds of 1:24 packs, collectors should uncover around 6-7 autographs per case. The selection consists of Synergy Autographs and Rookie Autographs. Those busting large amounts of 2018-19 Upper Deck Synergy can check out the UD Bounty program mission. 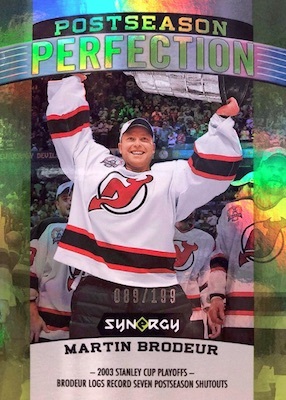 The first 50 collectors to complete the entire 100-card base set in the Red parallel earn a Bounty-exclusive Cast of Greatness card (#36 Elias Pettersson) and a 36-card Gold parallel for the entire Cast of Greatness set. All collectors who finish the full Red parallel set earn Cast of Greatness #36. It is important to note that not every Red parallel card has the redeemable code on the back that is required to complete the set. The odds show that every third Red parallel should have the code. These unique codes are used to essentially mark the card off in pursuit of the set using the online platform. 2017-18 UPPER DECK SYNERGY LOGAN BROWN NOTEWORTHY NEWCOMERS GREEN #NN18 3 4! 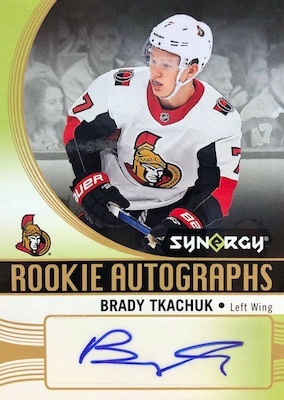 Buy 2018-19 Synergy NHL cards on eBay. BASE PARALLELS: Red (1:4), Blue (1:8), Green (1:16). LEGENDS PARALLELS: Red (1:16), Blue (1:48), Green (1:96). ROOKIES 1 PARALLELS: Red (1:2), Blue #/799, Green #/299. ROOKIES 2 PARALLELS: Red (1:8), Blue #/599, Green #/199. ROOKIES 3 PARALLELS: Red (1:80), Blue #/399, Green #/99. Overall odds - 1:24 packs. Specific group odds noted below. 42 cards. Serial numbered #/749. PARALLEL CARDS: Green #/199, Purple #/25. View the 2018-19 UD Synergy Hockey checklist Excel spreadsheet. apparently if they dont take this – why? they won’t sell it — they will get less of other UD product ..really?? I still hate myself for buying a box last year, little to no value and almost zero interest in the secondary market. Why are they keeping a set that was a complete BOMB. Would much rather they brought back Fleer Showcase. But than I miss the old Black Diamond, SPx, and SP Game Used also. It’s not Upper Deck’s products that are necessarily bad, but it is their pricing for those products. With exclusive licensing, there is no competition to keep prices reasonable. Synergy should be a $16/box product. If another card manufacturer was permitted to put out products, low-value products like Synergy would have to be priced in accordance with the value that the collector gets. I hope the hobby sends a message to Upper Deck with their dollars and avoids Synergy. Only then will they get the message. I love this set. Ots a little over priced out of the box of course, but it’s fun to collect on the secondary market. It looks like another Easter egg is a black parallel of the Cast For Greatness. There is a MacKinnon on eBay now and I saw a Mittlestadt in a break. Also, last year my card shop sold out on day one, so it may not be as hated as those vocal people may have everyone believe! I love this product. It features nice cards without the pressure of hunting jerseys and patches. The low number hits are exciting, and while the box price is indeed too high, the after market sales are very appealing. The cards look even better this year, and the insert sets especially feature nice designs. 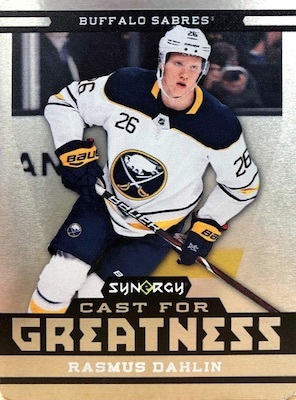 Cast For Greatness is my favorite subset that Upper Deck offers. While people do complain, and while product is plentiful, my local store sold out last year twice before I could finally get my own box. I joined a case break and there was a Cast for Greatness black hit, and I see a couple examples on eBay. I believe this is an easter egg / parallel not accounted for in the checklist. Additionally Andrei Svechnikov was a Glow Shift not noted above. The value just isn’t there for the product. They are nice looking acetate cards, but the QC isn’t there. I bought a box and there are cards with edge damage. This product has only sticker autos, and very little secondary market value. It would be fair if the price was around $30/box. Intriguing list of names on the auto checklist, but this product again is a total fail. Again Upper Deck has a monopoly and they should look into a less is more style with sets. A lot of garbage being released.